Sycamores were called upon to support Indiana State University during its inaugural Give to Blue Day on Wednesday -- and they answered in record-breaking fashion. Nearly 1,700 donors -- from Terre Haute to Australia -- contributed more than $430,000, making it the largest single-day fundraiser in university history. "The Division of University Advancement is overwhelmed with the outpouring of generosity for our inaugural Give to Blue Day. Thank you to the 1,691 donors who gave $436,243 to support Indiana State University. When Sycamores unite as one, great things happen," said Andrea Angel, vice president for University Advancement/CEO of the ISU Foundation. "A big thank you to our team, campus partners and advocates for ISU, especially Director of Annual Giving Hilary Duncan for her outstanding leadership." The university's goal was to engage 1,000 donors. When that objective was met before 4 p.m., two anonymous donors were inspired to pledge $10,000 if Sycamores brought the total to 1,500 donors. "Our first university-wide giving day was a huge success, and we are so grateful for the nearly 1,700 donors who participated," said Indiana State President Deborah Curtis. "This is a wonderful kickoff to a new era for private fundraising at Indiana State. Everyone who donated has been a crucial part of this accomplishment, and it's only the beginning of more great things to come!" A buzz energized campus throughout the day, as colleges and units held events to raise awareness. 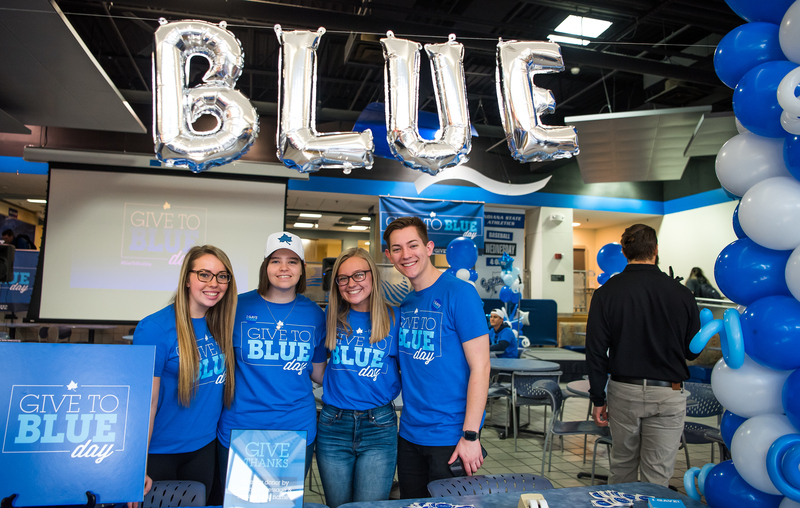 Among many others, the Bayh College of Education offered a waffle breakfast, and Barnes and Noble got into the spirit with a blue popcorn bar and blue lemonade. A midday pep rally featured the Spirit Squad and music from student-led radio station WZIS, as well as remarks from Angel and Curtis. Friendly competition among supporters added to the excitement and success of the event. Fifty-six matches and challenges were successfully completed, including one from Don, '67, and Linda Dudine of Magnet, Ind., who challenged students to contribute. The couple pledged $20,000 if 50 students would donate. By the time the pep rally started at 11:30 a.m., the goal had already been surpassed with 74 donors. A total of 252 students contributed in 24 hours. A music alumnus, Don Dudine is vice-chair of the foundation board. "Don and Linda are passionate about creating a culture of philanthropy at Indiana State, and their generous gift was intended to inspire students to give," Duncan said. The Bridge the Gap scholarship, a new initiative that aims to provide need-based scholarships for students, was also a beneficiary of Sycamores' generosity. This initiative received more than $100,000 from 104 donors and will begin making an impact on campus this fall. "Give to Blue Day was truly an impactful day for Indiana State. It was amazing to see our university, the Terre Haute community and Sycamores around the world come together to support our students. We are incredibly grateful for everyone's contributions," Duncan said. The lead up to Give to Blue Day has been months in the making, with ambassadors sharing the reasons why they support Indiana State on social media. In total, 346 Sycamores were social ambassadors, helping to raise more than $18,000 for the day. University College Dean Linda Maule was one of the ambassadors leading the charge -- and she was not disappointed with the day's results. "Over the past two decades at State, I have experienced many opportunities to be proud of my fellow Sycamores. But yesterday's first day of giving surpassed all of my expectations," said Maule. "Former and current Sycamores, faculty and staff gave generously. As a result, more Sycamores will be able to stay enrolled and fulfill their aspirations of a better life for themselves, their families and their communities. Additionally, many more Sycamores will be afford high-impact educational opportunities, including study abroad and undergraduate research experiences, which will better prepare them for the careers of the 21st century." For more information about Give to Blue Day or to contribute to Indiana State University, go to indstate.edu/give. Photo: https://photos.smugmug.com/Events/Events-by-Year/Campus-Wide-Events-2019/Give-to-Blue-Day-2019/i-FKJXcVh/0/71d7e2b4/X5/March%2013%2C%202019%20Give%20to%20Blue%20Day%20DSC_0074-X5.jpg -- From left, Indiana State University students Annie Bowen, Michelle Chew, Sammy Edwards and Kyle Hollinden.